Using social media marketing gives business, both small and large, the ability to reach current as well as potential customers more effectively. With the immense growth of the social media sites, your customers, are already interacting with other brands in the social media, therefore, it is only fair that your business should also have a strong presence in the social media to increase the exposure to your brand, products or services. With the correct implementation, social media marketing can lead to enviable success to your company. At Rocket Marketing and Design, we have an extremely talented team of social media consultants, who live and breathe the social media. We are well versed with the current strategies that the big dogs are using to crush it with on the social media and we continuously learn new approaches so that we can deliver fast and quality results for our clients. We are privileged to work with a small but effective team of skilled social media experts, who are dedicated to helping businesses achieve all their social media marketing goals. 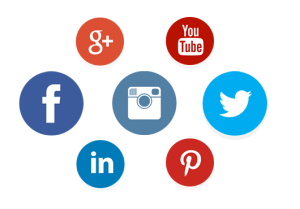 You will receive personalized attention from us and we will work with you in real time for the success of your social media campaigns. Social media is a vast field with lots of components, some of which may not be applicable to your business. As a professional social media agency West Palm Beach, we provide you with tailored solutions that will bring maximum benefits to your business. Depending on your marketing goal, whether you need to get more leads, monitor comments about your business, drive more traffic to your website, or increase awareness on your products or brand, we guarantee to offer you with the relevant type of services you need. Creating a Facebook Business Page or an Instagram account is not enough to let you reap the benefits of the social media. At Rocket Marketing and Design, we set up your accounts in the correct manner and optimize them so that they are ready to help you achieve your specific social media marketing West Palm Beach goals. We work on Facebook, Twitter, Instagram and Google+. After we set up and optimize the accounts professionally, we then use white hat methods in building up followers or fan base. Unlike other dirty social media agencies in West Palm Beach, we don’t use bots to increase engagement or fans in your social media accounts. This implies that every fan or follower in your accounts will be real human beings whom you can engage and interact with. We are also pleased to let you know that we offer client exclusivity, where we agree not to work with any of your competitors for the duration you have a valid contract with us. In addition to all these, we will provide you with reports at the end of each month so that you can gauge the progress of our social media marketing West Palm Beach for your business. Call us today at 786 – 309 – 8333 or send us a mail via the contact form if you are ready to take your business to the next level by using the power of the social media.